CTA fended off a tough charge from GTA Prep in the second half, but their world class defence managed to keep them undefeated against Canadian High School programs this year. Enoch Kalambay led his team with 21 points in the win. CTA is next off to Rhode Island on the weekend of February 2-3. Orangeville reclaims the top spot in the country after two wins this week over top 15 programs in Canada. With those wins, Orangeville also remains at the top of their league standings. To top off a successful week, Joe Jones has been offered from University of Detroit Mercy, one of the top Mid-Major programs from the Midwest. Three straight wins in week 11 has Ridley College sitting atop their division in league play. Jaden Bediako had another monster week on the boards, while Anthony Duadu managed to rack three straight three’s in the final quarter against Central Tech to solidify that win. The Tigers are back in action in a heavyweight tilt against Thornlea later today. Two tough losses to two top level opponents has FHC still sitting on the outside looking in to the top 5. Regardless, Jalen “Mighty Mouse” Menzies continues to rack up interest in the NJCAA realm, so look for him to commit in the next few days. RISE was in Buffalo over the weekend for the Corey Graham Showcase, where they fell to SPIRE Academy post grad. Rahmir Moore managed to get MVP honours for the game after netting 19 points for the Wolfpack. RISE is back in action later today against A.I. Red. Thornlea had a league win over Vaughan this past week, while also falling to #4 nationally ranked Hargrave Military Academy according to Prep Circuit. The Thunder are back in action later today against Ridley College. Crestwood handled business against TBA this past week with the 99-83 win. Jachobi Neath had 27 in the win, while Jo Smith grabbed a double-double with 20 points and 11 rebounds. TRC’s week is just more proof that it doesn’t matter who you face at this level, you need to bring your best game every night or risk the consequences. Both games were tight from start to finish, but even with a mini losing streak, TRC is still in a great position to close their league play out strong. Rothesay got another tournament win to kick off 2019 at the Riverboat Classic. Shyheim Malcolm has managed to gain a number of D-1 looks following a very productive first half of the season. Rothesay will now be off to New York for the Gotham Winter Classic. Some big wins for Vaughan over this week, as they managed to be the first team to knock off TRC Academy in league play this year. Vaughan then had the pleasure of being the only Canadian team to register a win at the Corey Graham Showcase out in Buffalo over this past weekend. It was the usual suspects of Wazir Latiff and Ryan Brooks who did most of the scoring damage for the Voyageurs. A tough loss to Thornlea still has them below .500 in league action, but look for Vaughan to continue climbing if they manage to keep pace with some of the best in the country. Reuben Hasabenebi managed to get some eyes on him after putting LaMelo ball on a poster this past weekend. Southwest managed to go 1-2 over the week with two losses to two of the top programs in North America in Orangeville Prep and SPIRE Academy. Add in a thrilling overtime win over Lincoln Prep, and Southwest has managed to hold the 12 spot for at least another week. A loss to Ridley College has King’s Christian now just one game above .500 in league action. Luka Sakota had 22 in the loss, while Jaylen Passley managed to get 20 points. Alex Nwagha also had 13 points and an admirable performance against one of the toughest frontcourts in the country. TBA had a battle on their hands when they took on Crestwood last Thursday. Marcus Masters and Ihsan Khan each had 23, but the size and shooting of Crestwood proved too much in the second half. TBA was then off to Buffalo for the Corey Graham Showcase where they took on SPIRE Academy’s Post Grad team. It was another disappointing result, but TBA can take solace in the fact that their exposure has definitely gone up after this weekend. Halifax is currently off until February for exam period. Edge School is off for exams, look for Manyang Tong and co. to be making a big comeback as they host the NPA Western Session from February 7-11. GTA Prep had a tough week in the win-loss column, but a solid week on the exposure trail. They first fell by ten to the top ranked team in the country in Canada Topflight Academy in NPA action, and then traveled to the Corey Graham Showcase out in Buffalo, New York, nearly knocking off Rocktop Academy in front of a gym of scouts and coaches. Matthew Green managed to turn some heads against CTA, while Josh Haughton grabbed MVP honours in Buffalo after dropping 38 for GTA. Central Tech has managed to come out of the winter break with a purpose. After pulling off a mild upset over Lincoln Prep on the road, they headed over to Ridley College and nearly knocked off the Tigers before a big fourth quarter. Still on the road, the Blues then managed to pull off one of the biggest upsets of the year, knocking off TRC thanks to a Deandre Goulbourne bucket in the final seconds, along with some tough team defence to close out the game. The Pumas were all over social media this past weekend after taking on the LaMelo Ball and the #5 ranked SPIRE Academy according to Prep Circuit. Although it wasn’t the result they may have hoped for, Shak Pryce managed to leave an impression on the multitude of college coaches in attendance, guarding Ball while managing to drop 35 points on one of the top programs out of the midwest. Despite a 48 point performance from Tyler Sagl, and a career high 38 points from Bennett Grumbach, the Huskies fell just short of knocking off Southwest Academy in league action this past week. Lincoln Prep will have to have a short memory however, as they are right back at it later today against FHC in league action out in Rexdale as they try to snap a 3 game skid. SBA was back in action this past week with a few exhibition matchups against some Canadian colleges. Despite coming up short, head coach Sean Tyson has been more than pleased with his team’s progression coming out of the winter break, and feels this roster can run with anyone in the country. Saint Laurent beat Henri Bourassa by 12 this week in a 62-50 win with a short bench. Their next league game will be against Brebeuf in mid march with provincial in the final first weekend of April. 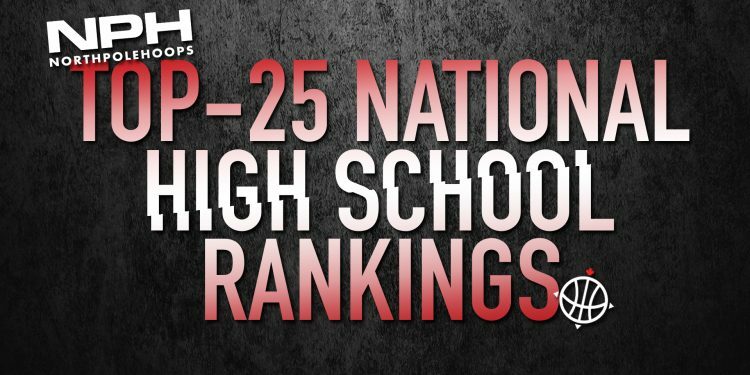 LaSalle Secondary out of Kingston makes their first appearance on the NPH Top 25 National High School Rankings. Cole and Luka Syllas are two underrated players that have guided LaSalle to a 4/4 tournament run so far. LaSalle holds a 67-6 record in the last two seasons combined. St. Benedict’s comes back into the top 25 with their 4th straight Saint Invitational. Ben Mascarenhas, Raf Llorin, and Trent Johnson were named all-stars for Benedicts. A tough defensive team with good playmakers – they will be dangerous at playoff time. North Park has been one of the top team this season and have represented Brantford very well. Judah Stewart has been one of the best scorers this HS season. Duane Notice, Chris Egi Capture MVP…Marcus Ottey Shuts House Down @ NPH Platform!